WE HAVE A FANTASTIC ANTHOLOGY RARING TO GO! PRE-ORDER YOUR COPY, SUPPORT THE MUSCULAR DYSTROPHY ASSOCIATION OF NZ, AND HELP THIS PROJECT SPRING TO LIFE. The Best of Twisty Christmas Tales—31 children’s stories by 27 authors, including international best-sellers Joy Cowley, David Hill and Dave Freer. Come along for the sleigh ride of your life. These Twisty Tales will weave their festive magic, whipping across NZ pastures, scattering fairy dust on the way to a Christmas BBQ! WOULD YOU LIKE TO BE ONE OF SANTA’S ELVES? BE PART OF TWISTY CHRISTMAS TALES AND MAKE CHRISTMAS DREAMS COME TRUE! Click the reward you’d like, fill in the details, and it’s yours! We only receive funding if our goal is achieved by 4 November 2014. We also have a stretch goal, so we can print more books and get this collection of fantastic NZ Christmas stories to more kiwi kids and help New Zealanders with muscular dystrophy. So, why not buy one for your nephew, another for your niece and three for your uncle—not to mention a copy for each of Santa’s elves! · Peter Friend, Eileen Mueller, A.J. Ponder—Phantom Feather Press Editors. Help the team at Phantom Feather Press bring this anthology to life, and reap great rewards. Remember our deadline is 4th November, so pledge now and share this with your friends and family. What if your muscles stopped working properly? It sounds like a twisty fiction story, but for thousands of people, it’s reality. The Muscular Dystrophy Association of NZ exists to provide support, advocacy, information, and understanding to New Zealanders living with any one of 62 different neuromuscular conditions. The majority of these are genetic and cause progressive muscle weakness, often resulting in difficulty walking and performing the basic tasks of life such as eating or getting dressed. In some instances, lifespan can be severely shortened. The MDA’s mission is to provide New Zealanders living with neuromuscular conditions with personal support and information, and to advocate, influence and promote equality of opportunity. This includes providing newsletters, In Touch magazine, latest research/treatment information, a Fieldworker service, assistance navigating the medical system, help talking to family members, schools, or employers, and developing support networks. MDA relies on donations to continue providing this service and is very grateful for the support of the team at Phantom Feather Press. Thanks again for pledging to support The Best of Twisty Christmas Tales. We hope you enjoy your books and cards! Only an hour or two to go! Thanks for a successful Pledge Me campaign. We have a few hours to go and have already achieved our initial goal and our stretch goal! A fabulous result. We’re hoping that you all have a great “kiwi” Twisty Christmas this year! After the campaign closes tonight, Pledge Me will take up to three days to send Phantom Feather Press the details of who pledged for which rewards. Then we can send your books, cards, ebooks and the other great rewards you purchased. So please be patient, your books will be with you very soon. See you at the launch – with Twisty Christmas music, nibbles, drinks, art and books galore! Rustle up a little magic in digital or ebook form with either of these two packages containing Wizard’s Guide to Wellington on PledgeMe. Alec finds a magical book, “The Wizard’s Guide to Wellingtowne,” lying in the corridor of Wellington Airport. But it doesn’t help answer his questions. Where is his father? Where is Perrin, the mysterious English cousin they were supposed to be meeting? And, most importantly, am I going mad, or is someone playing practical joke? Perrin arrives at “Wellingtowne Airport” only to discover, Ike, her cantankerous wizarding guide had disappeared. She has been warned abut the dangerous city of “Wellingtowne,” but when she sets out to find her missing uncle she has no idea just how dangerous it is going to get. Two cousins from different worlds must rescue Wellington from wizards who wish wake a very dangerous taniwha. A.J. Ponder is the author of award winning stories published in New Zealand and internationally, and has written plays and stories for School Journals in New Zealand and Australia. Lost in the Museum (YA) contains two companion pieces Lost at Te Papa & Found at Te Papa, about a boy and his family who are dropped through time into Victorian Wellington. She was also instrumental at creating the many links that hold the collection together. She also has a BSc Hons and Dip Teach, but doesn’t tend to mention these qualifications, maintaining reading should be fun first…and fun second. More here. The Santa’s Little Helpers and Christmas Wizard packages are both available on PledgeMe – and Wizard’s Guide, The Best of Twisty Christmas Tales and Lost in the Museum are all available for order, or pre-order on Amazon. Twisty Christmas Drawing Competition prizes include copies of the book, posters and sets of special edition Twisty Christmas Cards – all illustrated by Geoff Popham. 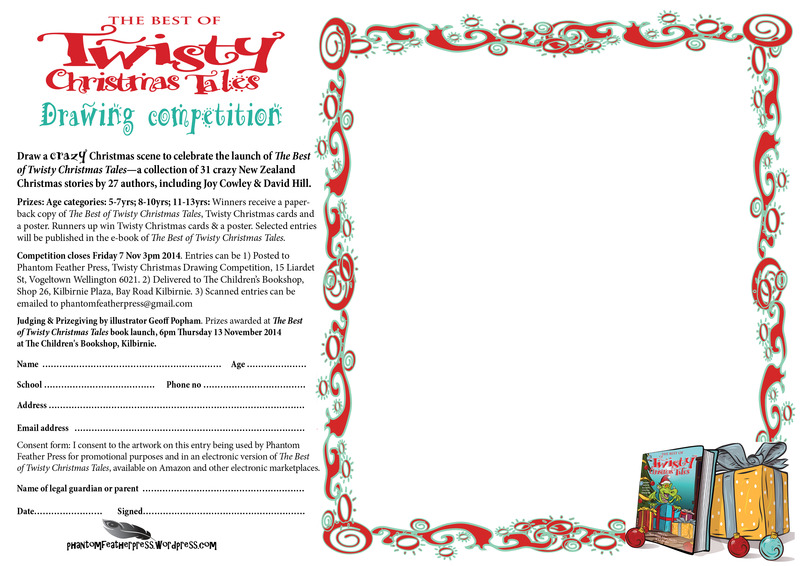 Selected entries will also be published in The Best of Twisty Christmas Tales e-book. 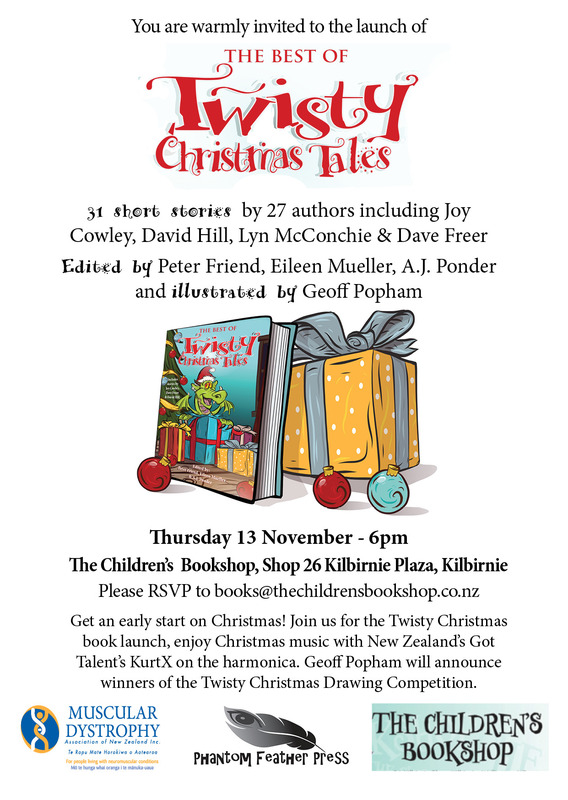 Prizes will be awarded at The Best of Twisty Christmas Tales book launch, Thursday 13 November 2014 6pm at The Children’s Bookshop, Shop 26, Kilbirnie Plaza, Kilbirnie, Wellington. Come along and join in the fun. Remember, entries must be received by 7 November 2014. The team at Phantom Feather Press. Award-winning author Lee Murray has donated five copies of her young adult novel, Battle of The Birds - so look out for Twisty Bird, and Candy Cane offers on our PledgeMe campaign to get a copy of this stunning book and more. 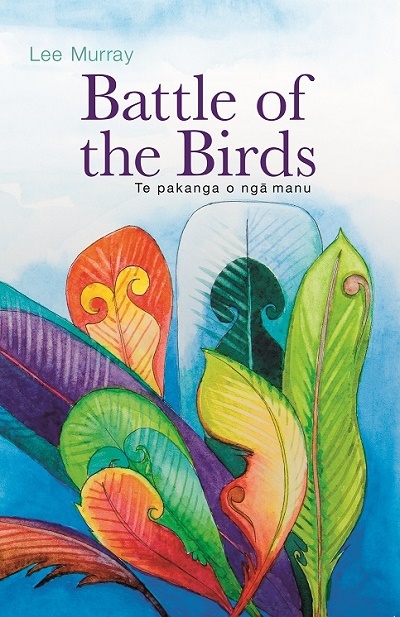 Battle of the Birds - blends fact and fiction in a fantastic action‐adventure for children and young adults, Battle of the Birds by award winning author, Lee Murray, explores New Zealand's varied birdlife, flight and migration, democracy, early medicine, and most of all, friendship. 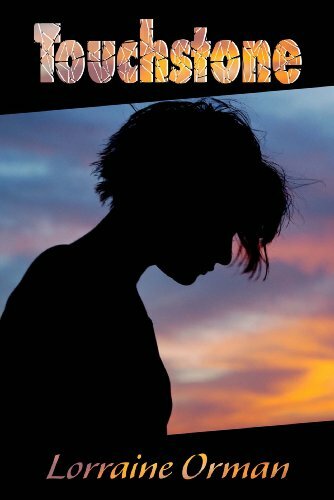 Annie's family has moved to Wisconsin, and with her only friend away in Florida for the holidays, 11 year‐old Annie faces a long, boring summer. She lies on an eagle‐shaped hill and daydreams of home. Imagine her shock when the eagle breaks free from the earth and flies her home to New Zealand! But it's not a New Zealand Annie is familiar with, and when she and her new friend Moana almost walk smack into a giant moa, Annie realizes why. The eagle has flown her back to New Zealand, but she's arrived a thousand years too early, and right in the midst of a battle between the birds. However, Annie's visit isn't entirely unexpected...she can speak the language of the birds and is part of an ancient prophecy. Now she must mediate in a battle between the great bird chieftains: the violent and vengeful Te Hokioi and the thoughtful philosopher, Moa. Suddenly, Annie's summer doesn't look so boring after all! Can Annie and her friends help the flightless overcome the flying predators led by ambitious Te Hokioi? Will the gentle Moa survive to live on in history? And will Annie ever make it back to Wisconsin? 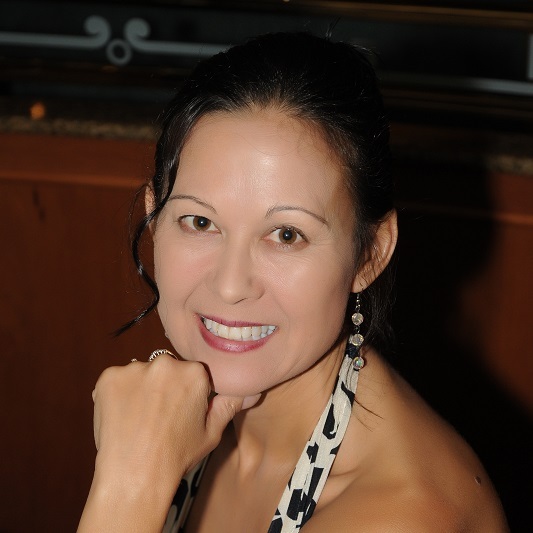 About the Author - Lee Murray is multiple award winning author. It would take far too long to name all her awards, from Sir Julius Vogel Awards to the Australian Shadows Award. Find out more on Lee Murray's website. "Feeling homesick is horrible. The new place is exciting but it isn't as good. The food is different, nothing is familiar, and people talk funny. It was like that when I moved to Wisconsin: I missed New Zealand so much! I missed my friends, the beach, rugby games, driving on the left-hand side, even food like Marmite and mince pies. Then I discovered Wisconsin's intriguing animal-shaped effigy mounds, ancient sites with no known purpose. I imagined these mounds were secret portals to other places and if I found the right one it would whisk me home to New Zealand. But people say you can never go home. Things change while you are away: new buildings go up, new roads develop, and people move on. So when I wrote Annie's adventure I thought I might explore this idea, while also drawing on my experience of trail running on forest tracks. I sent Annie back to a time when Moa and Te Hōkioi dominated the wild New Zealand bush. Eventually, I came to love Wisconsin with its red barns, yellow school buses and blue, blue lakes. I loved the sound of my shovel in the snow, cheesy bagels, fall leaves,sledding, and the lovely friends I made there. Perhaps it's time I looked for a New Zealand portal, so I can pop back (in time) for a visit!" Lee Murray's Sir Julius Vogel Award winning novel, Battle of the Birds is available in print from The Battle of the Birds website along with teaching notes for NZ schools & the ebook available from Amazon but why not get Battle of the Birds and The Best of Twisty Christmas Tales for only $NZ36 here on our PledgeMe campaign? Thanks to you, we reached our initial goal of $810! Thank you so much to our loyal followers and pledgers for supporting our project. We know you're all going to have a wonderful Twisty Christmas this year—with 31 great Twisty Christmas Tales to read, a stack of Twisty Christmas Cards to send and, no doubt, some yummy treats to nibble on. Our campaign continues, so please help us share some more Christmas cheer. We have a new stretch goal of $1200! Just an additional $400 more will enable us to print more books and get them into the hands of more kiwi kids this year—helping the Muscular Dystrophy Association even further! Sixteen–year-old Skye hates secrets. She’s desperate to know why her mother has cut herself off from the rest of the family. When Skye travels to the remote West Coast to meet her ailing great-grandfather, she’s determined to unearth the truth. Her first challenge is discovering she has a teenage cousin, Josh. Her next problem is accidentally hearing about a secret protest action organised by an eco-warrior group who are fighting to prevent an open-cast coalmine on the Buller plateau. Skye is drawn into several explosive situations: the shocking truth about her parents and her aunt; the deathbed confession of her great-grandfather; and the cruel betrayal of Josh’s environmental protest group. Will Skye find the courage to stand up and fight? To read a sample chapter visit Lorraine’s website http://www.story-go-round.net.nz Lorraine Orman is a book reviewer, literary judge, and writing tutor with nine published print books for children and young adults, including Cross Tides which won the NZ Post Best First Book Award in 2005. Like Cross Tides, Touchstone is a blend of present-day and historical stories. To download a free Secondary Teachers’ Resource Kit visit http://www.story-go-round.net.nz/pdf/touchstone_teachersresourcekit.pdf The setting of Touchstone originated with Lorraine’s in-laws, some of whom worked in the Buller coalmines. Publication: April 3013; ISBN: 978-0-473-23972-5 (EPUB); 978-0-473-23973-2 (Kindle); Publisher: Ashmore Books; International Price: $4.99 (US) approx 6.27 (NZ); Age level: Secondary. Ebook available from Smashwords and Amazon, but why not get two great books for onlt $NZ10 here on our Pledge Me campaign? Just choose Twisty Touchstone reward and you receive Touchstone and The Best of Twisty Christmas Tales. We know you'll love Lorraine Orman's story Bandit in The Best of Twisty Christmas Tales. But get in quick, there is only one Twisty Touchstone combination available! Sneak Preview Twisty Christmas Cards! Our artist, Geoff Popham, has worked his magic again, creating cool Christmas cards from four of the illustrations in The Best of Twisty Christmas Tales. Kids will love receiving a card along with their copy of the book when you tuck their stockings full of goodies this Christmas! We can’t tell you which card matches which story, because we don’t want to give away any spoilers! Have some fun this Christmas! Surprise kids with matching cards and the great NZ Christmas stories in The Best of Twisty Christmas Tales! We’re over half way to our goal. The team at Phantom Feather Press would like to say a special thank you to all of our wonderful supporters for providing some fairy dust to help our Christmas wishes come true this year. Please continue to share our Pledge Me campaign with your friends, encourage more children to enjoy great kiwi literature this Christmas, and support the Muscular Dystrophy Association of New Zealand. This campaign was successful and got its funding on 04/11/2014 at 1:11 PM. Join us in Santa's workshop and help bring Twisty Christmas to New Zealand. Your name will appear in the ebook as one of Santa's fantastic elves who helped us reach our goal. You will receive a brand-spanking-new ebook of the anthology, delivered by sleigh to your inbox. Your name will appear in the ebook as one of Santa's fantastic elves who helped us reach our goal. 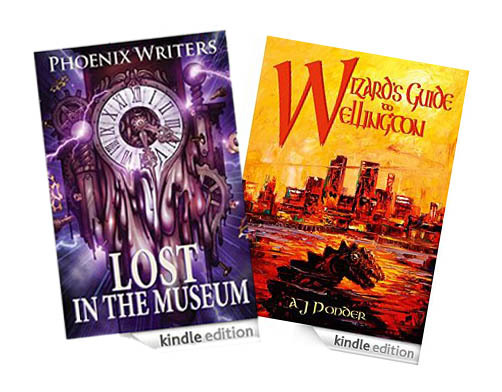 Two fabulous Wellington e-books will be yours: children's novel, Wizard's Guide to Wellington, by Twisty editor and award-winning author A.J. Ponder; and Lost in The Museum, an anthology of crazy stories set in Te Papa, NZ's national museum. Send your friends Twisty cards this Christmas. They’ll love Geoff Popham’s artwork. This pack contains 4 assorted coloured illustrations from the book. Postage included. Get Lost in The Museum this Christmas with ebooks of The Best of Twisty Christmas Tales and Lost in The Museum - Phoenix Writers' anthology set in Te Papa - NZ's national museum. Find out the secret in young adult novel Touchstone by award-winning author Lorraine Orman, with ebooks of Touchstone and The Best of Twisty Christmas Tales. Your name will appear in the ebook as one of Santa's elves who helped us reach our goal. Twice the friends? 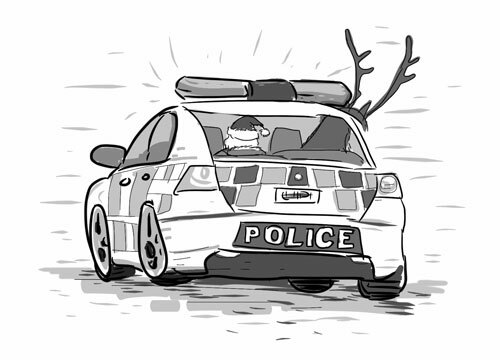 Get two packs of Twisty Christmas cards illustrated by Geoff Popham (8 cards.) Postage included. The more the merrier! Get three packs of Twisty Christmas cards (12 cards) illustrated by Geoff Popham. Postage included. One terrific A4 Twisty Christmas Tales limited-edition colour poster will be yours, signed by our illustrator Geoff Popham. Postage included. Sprinkle a little fairy dust on your pavlova with a print copy of The Best of Twisty Christmas Tales. For postage outside of NZ please add $4 to Australia, or $10 to USA, UK or Europe. Send crazy Christmas cards while you read The Best of Twisty Christmas Tales! 1 pack of 4 cards and one print copy of the book. For postage outside of NZ please add $4 to Australia, or $10 to USA, UK or Europe. Take flight this Christmas with two books: print copies of The Best of Twisty Christmas Tales, and young adult novel Battle of The Birds, by award-winning author Lee Murray. For postage outside of NZ please add $6 to Australia, or $15 to USA, UK or Europe. 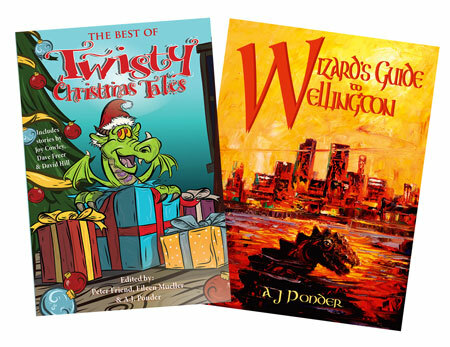 Have a magical Wellington Christmas with two new books: print copies of The Best of Twisty Christmas Tales, and children's novel Wizard's Guide to Wellington - by Twisty editor and award-winning author A.J. Ponder. For postage outside of NZ please add $6 to Australia, or $15 to USA, UK or Europe. Reward yourself and a friend with two print copies of The Best of Twisty Christmas Tales. For postage outside of NZ please add $6 to Australia, or $15 to USA, UK or Europe. Be prepared this Christmas with more cards and an extra book for your mother-in-law. 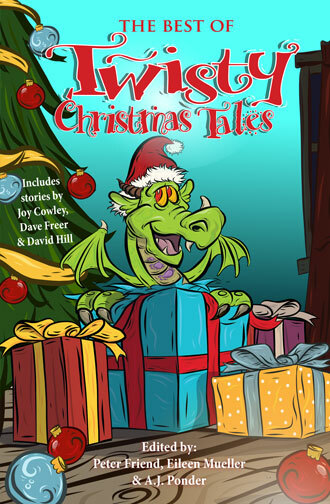 2 packs of cards (8 cards) and two print copies of The Best of Twisty Christmas Tales. For postage outside of NZ please add $6 to Australia, or $15 to USA, UK or Europe. 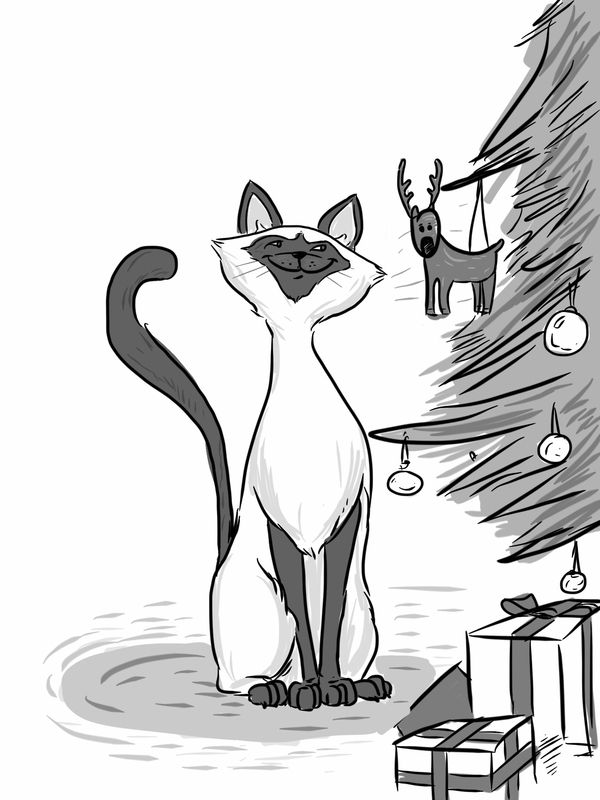 Reward yourself, a friend, and your cat with three print copies of The Best of Twisty Christmas Tales. For postage outside of NZ please add $7.50 to Australia, or $19.50 to USA, UK or Europe. Grab a sweet deal this Christmas with one print copy of three books: The Best of Twisty Christmas Tales; young adult novel, Battle of The Birds, by award-winning author Lee Murray; and children's novel, Wizard's Guide to Wellington, by Twisty editor and award-winning author A.J. Ponder. For postage outside of NZ please add $7.50 to Australia, or $19.50 to USA, UK or Europe. This Christmas, gift yourself a critique with award-winning author and Twisty editor, Peter Friend (published in Asimov and other major international magazines.) Critiqued stories should be up to 3,500 words. Have a very Twisty Christmas with 3 packs of cards (12 cards) and three print copies of The Best of Twisty Christmas Tales. For postage outside of NZ please add $4.50 to Australia, or $16.50 to USA, UK or Europe. Be Santa Claus this year and spread Twisty Christmas cheer with five print copies of The Best of Twisty Christmas Tales. For postage outside of NZ please add $11 to Australia, or $28 to USA, UK or Europe. The Christmas Monster bonuses have sold out - so we're adding another two. Grab a monster bundle of ten print copies of The Best of Twisty Christmas Tales and all your gifts are sorted. For postage outside of NZ please add $17 to Australia, or $42 to USA, UK or Europe. Grab a monster bundle of ten print copies of The Best of Twisty Christmas Tales and all your gifts are sorted. For postage outside of NZ please add $17 to Australia, or $44 to USA, UK or Europe.